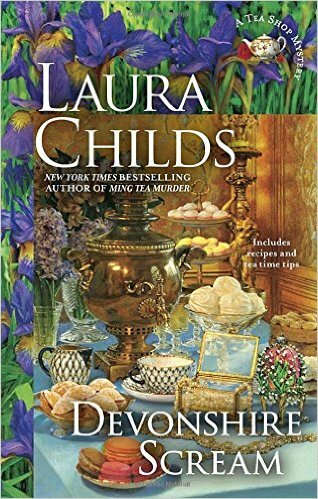 by Laura Childs is being released on March 1, 2016. I was sent a preview copy and an offer for a book giveaway (details below). the stories center around Theodosia Browning, owner of the Indigo Tea Shop in Charleston, SC. Theodosia is known for her sleuthing and often solving of crimes usually including a murder. the precious gems and jewels on display. the jewelry store owner's niece. Could the robbers be part of an international ring, or someone local? Theodosia promises to help find out who is responsible. Devonshire Scream may be my favorite book in this series. It was entertaining, intriguing and easy to read. and ways of bringing tea facts and tidbits of tea education into the suspenseful story. The author, Laura Childs, has kindly offered to provide a book giveaway for my blog. Please leave a comment with a way I can contact you by Friday evening March 4, 2016.
and the book will be inscribed and shipped directly from the author. Our family uses English Bone China tea mugs every day. but not with this pretty teacup design. I like the thumb rest on the handle and the light weight of these mugs. These were a fun eBay find! to several questions after showing a glimpse of one of the quilts in recent posts. You can probably tell from the photo above why we named it the teapot bedroom. This large bedroom with two large closets was the master bedroom before 2009.
made by my uncle Lester. The quilts are Pottery Barn Kids from several years ago. Various items gathered from my mother, Aunt Ida and Aunt Mary are on the dresser. embroidered pillow case for me years ago. The dressing table below was my Aunt Hazel's. The adjoining bathroom is decorated with my tea for one sets. Don't you agree? This is the the teapot bedroom. Tea ladies are the best! 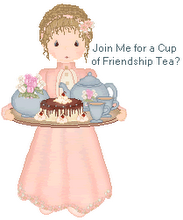 Theresa, a member of the Afternoon Tea Across America Facebook group. Theresa told me she had one Tea Rose cup and saucer she wanted to send me. The cup and saucer arrived and is in the photos with the child's tea set. on Sunday in the Cracker Barrel Store. hey have a Coffee, Tea and Chocolate theme of products. for our school to participate. But we have come to enjoy it. It is a fun sport for elementary through high school. Their scores are ranked in their age group. After Saturday morning play practice, Austin had another tournament. and there because she was staying the weekend with us. On to the Mexican restaurant and before shopping. Patricia Miller is the winner of the cute measuring spoons! leave a comment by 8:00 p.m. Saturday February 20th. Please include contact information in your comment. Late Monday night Austin made himself Gluten Free toast with orange marmalade. We only had a smidgen of marmalade so he asked if he could use Lemon Curd. He loved it, and I promised to make scones Tuesday morning. The weather prediction was for another 3 to 5 inches of snow to fall during the night. Yes, we had another snow day from school. That makes six. I baked gluten free scones using a Sticky Fingers GF mix. Glenn was here too, because his flight to D.C. were cancelled two days in a row. BelGioiso Mascarpone and Robertson's Lemon Curd. The guys declared the Mascarpone to be as good as real clotted cream. texture and taste is better than many fake concoctions we've been served. by adding a cup of cool water and 2 Tbsp. oil. Our favorite flavors are the Original, Meyer Lemon and Blueberry. I ordered the mixes from Amazon for convenience. Looking for sunny days and warmer weather soon! We enjoyed Valentine's weekend, but nothing went according to plans. Archery Regional Tournament to be held Saturday evening. nights for their lovely Valentine's menu, so he scheduled Sunday Brunch. or so it seemed. All restaurants he called were booked or had a 2 hour wait. because they have Udi's Gluten Free Buns and amazing Smash Fries. On to Nicholasville for the tournament at 8:00 p.m.
cross-town rival school was shooting at the same time. Below: Austin and Josh moving back to the 15 meter line. By Sunday morning it was obvious 5 inches of snow was heading our way. the snow began to fall and dinner cancellations were made. It was our first time to eat two special meals at the hotel in one day! The hotel is about a 3 minute drive from our house. We had no problem getting there. due to a multiple vehicle pile-up. People were stranded for hours. Many folks were coming off the road and checking into the hotel. was very worried about her son being stranded on I-75. was "driving" in the weather. They had been sitting on the highway for 3 /2 hours. They enjoyed warm beds, warm showers, and breakfast before departing this morning. They arrived safely at Cumberland a little over an hour later. And, the cat was glad to have her special napping bed back after their departure. There is never a dull moment at our house! and flavored teas, especially floral teas and tisanes (herbal blends). in my opinion, is lightly scented and smooth tasting. More than 80% of the world's Bergamot is grown in southern coastal Italy. Enjoy a special cup of tea to celebrate. A photo (below) from my first Valentine's blog post in 2008. The wreath Lynn found for me. When you see this on my front door, you know it's February. My tea this morning is Harney and Sons Organic Breakfast Tea. of Indian black tea in pyramid sachets. The blend is Assam and a "smooth south Indian tea." published in the UK in 2015.
and I'm still in part one, The Tea Plant. It may just be one of my favorite books on tea!